The Keyword Tracker is possibly the oldest historical search engine ranking tracker that is still in use today. It was first launched in 2003, and has continuously had features added (as well as 3 complete rewrites) over the years. I had a legacy Keyword Tracker account, where is my data? Under the settings page, you can link your legacy Keyword Tracker accounts to your Digital Point account. You can link an unlimited number of Keyword Tracker accounts (in case you separated your data by different accounts). No data is lost. If you do not have a Digital Point account, you can create one here. 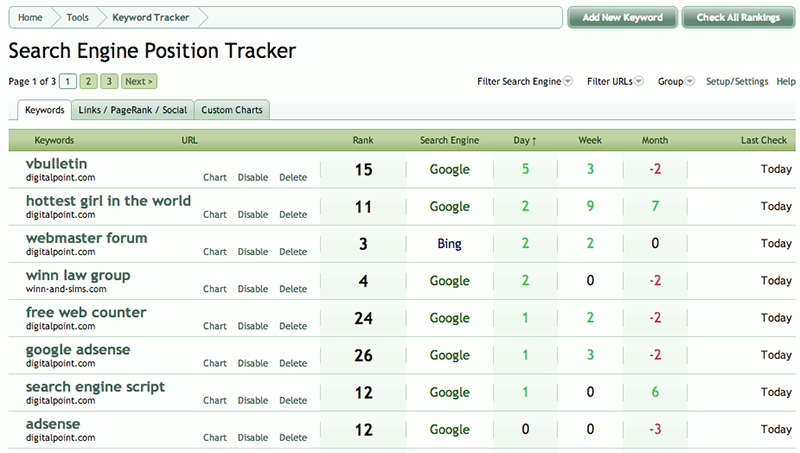 It's free to monitor rankings up to 20 positions (first two pages of search results) deep. Premium members can track positions up to 200 positions deep. 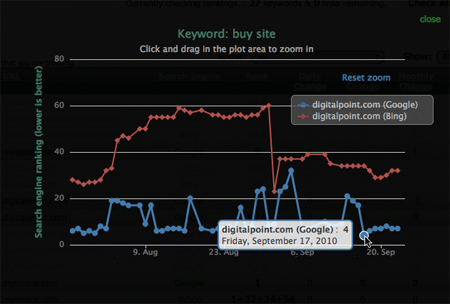 Can you track more than keywords? Yes, the system can track keyword ranking, number of backlinks and the number of pages your site has within a search engine's index. Yes, you can group all data (for example you could have a group for each client if you are an SEO firm). Yes, you can retrieve your data via API calls. You can find documentation over here. We don't "scrape" search engine results, instead we utilize available APIs given by each search engine to programmatically get the data. How many keywords/URLs can I track? Unlimited (although you are bound by the restrictions of the number of API calls each search engine allows per day). Can I track keyword positions for sites I don't own? Yes, you can, there are no limitations on the number of domains/URLs you can track. I'm getting an N/A (not available) ranking, but I know it should be in there. Make sure your URL matches... are you entering http://www.yourdomain.com, but Google returns http://yourdomain.com for example? It does a simple pattern match, so if Google returns http://www.yourdomain.com/products/wigets/ for example, you could enter the URL in the keyword tool as the exact URL or something like: http://www.yourdomain.com or even just yourdomain.com. I had a lower position, but now it's higher. Why does it still report the lower position? The system attempts to make as efficient use of API calls as possible by starting it's search from your last known position. Because of this, if your old position remains in its current place, but a new page in your domain ranks higher, it will stop searching for your rank after it locates the first one (which will be your last known position). To get around this, you can run the Check All function with the "check from beginning" option. I've set my settings to search 200 positions deep, but it's not working. Google's API has a hard limit of being able to search 100 positions deep, so for Google it's impossible to search deeper than 100. Bing should let you go the full 200 though. Who made this thing and why? A long, long time ago (2003), digitalpoint needed a way to track his historical rankings, so he made the tool for himself (there was no login/passwords or anything, it was just a single-user app). Then everyone that saw it wanted to use it, and a few days later user accounts were added to allow that. It was then rewritten from scratch in 2009, and again in 2013. We have a support forum over here that you can get any sort of help you need.